This post was written by Shayla. I'm amazed at her maturity, compassion and desire to help others. I've spent hundreds of days living in hospital rooms during my sister's cancer treatments. During the four years of treatments, countless visitors stopped by our little rooms to brighten our days. Recently, it was my first time to serve as the person on "the other side" - the one delivering the cheer and good wishes instead of receiving them and I loved it! 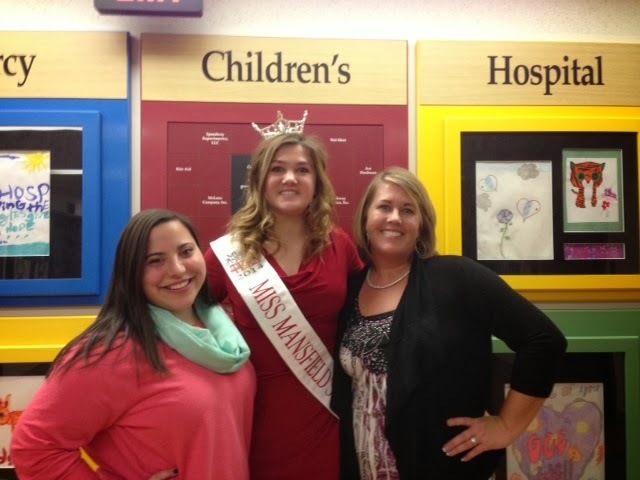 I was invited by a hospital employee to visit Mercy Children's Hospital in Toledo as Miss Mansfield's Outstanding Teen. 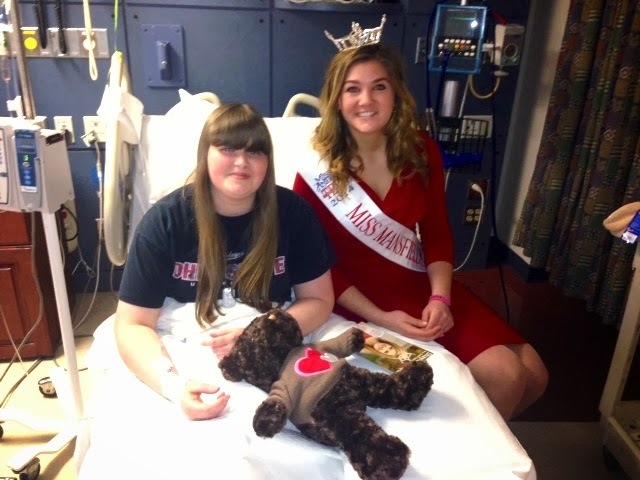 CMN is the national charity of the Miss America Scholarship Program. 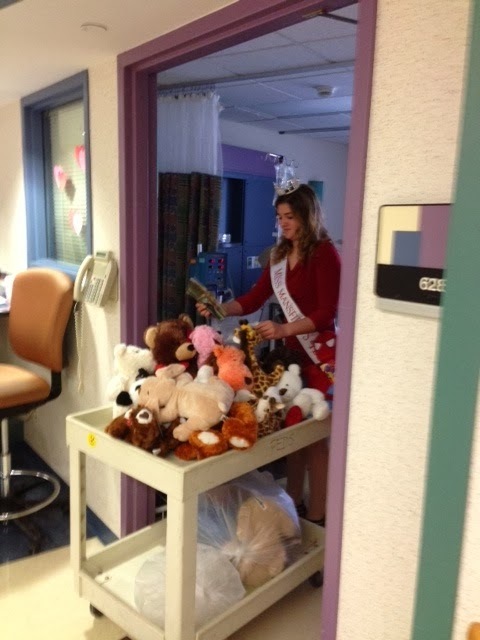 As a local titleholder, I am encouraged to serve as one of our state's CMN ambassadors, donating my time in the hospitals. I am happy to invest hours in supporting this wonderful cause. 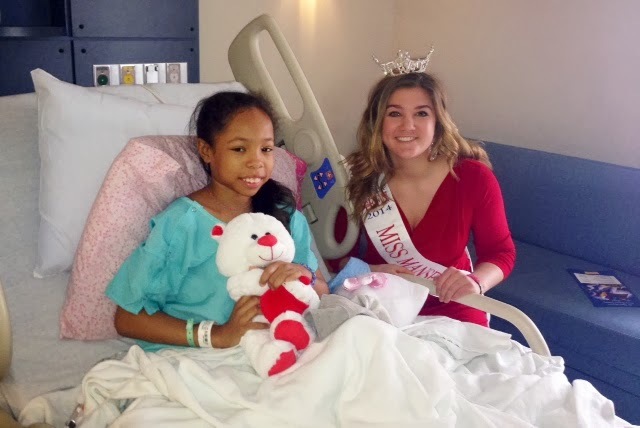 Christi treated at two CMN hospitals: Nationwide Children's in Columbus and the Children's Hopstial of Philadelpia (CHOP). I felt like Santa Clause as I pushed a big cart exploding with a variety of stuffed animals. In each room, the children picked out a toy and we'd talk for a while before I headed to the next room. I was able to visit 13-16 families. One little girl was so sweet, she presented me with a homemade bracelet; I immediately slipped it on my wrist. I wasn't sure what to expect heading into the visit, but the families were glad for the toys and incredibly welcoming of me. I enjoyed helping them pass the time. At the end of our day, the sweet hospital worker told me I did a wonderful job and asked me to come back in the spring. I definitely will!Get well, sweet children! You are in my prayers! 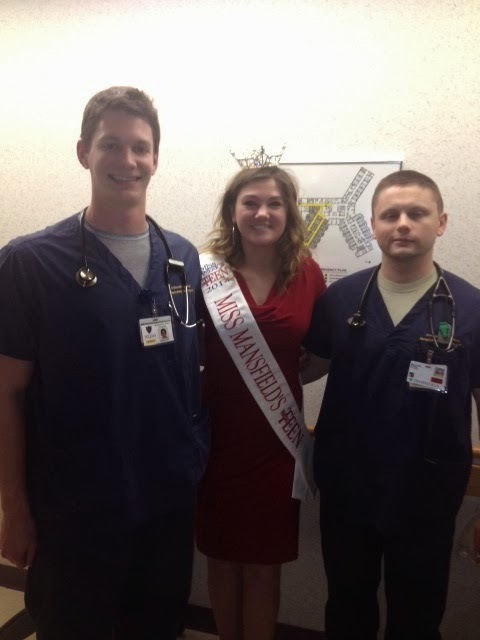 The sweet hospital lady said to these two gentlemen, "Would you like your picture taken with Miss Mansfield's Teen?" 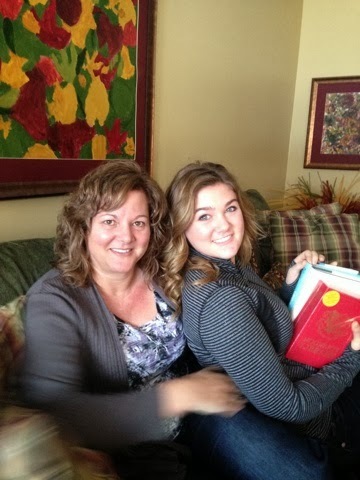 and I heard my mom whisper to herself, "I bet Shayla would like her picture taken with YOU!" We had to laugh about that later! Thanks to these awesome employees of Mercy Children's at Toledo! Thank you for inviting me! I loved helping out! You rock! Hello, sweet Bloggers! All is well with the Thomas team! Shayla had a great 15th birthday last week. It's been a very crazy winter for us; Shayla's school (which rarely closes for poor weather) has now been closed 13 days! I think she will be going to school much of this summer now! Shayla on her 15th birthday. We got her a few small gifts, mainly books and she had a great day! School was awesome and then she went to Heidelberg University's "Fireside Cafe" with friends after school followed by three hours of dance classes. I went in and sliced her birthday cake and sent it home with the dancers as they left the studio. HAPPY BIRTHDAY, SWEET SHAY SHAY! 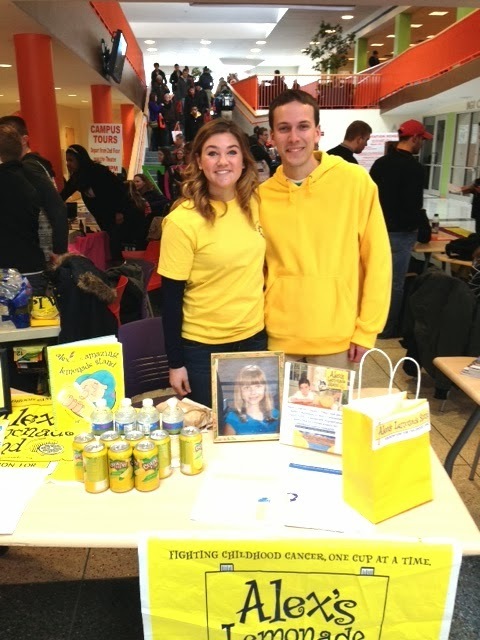 Shayla is looking forward to her "Lemon Ball" birthday fundrasier for Alex's Lemonade Stand. She wants to raise $1500.00 and so far, thanks to sweet donors, she has raised $900. 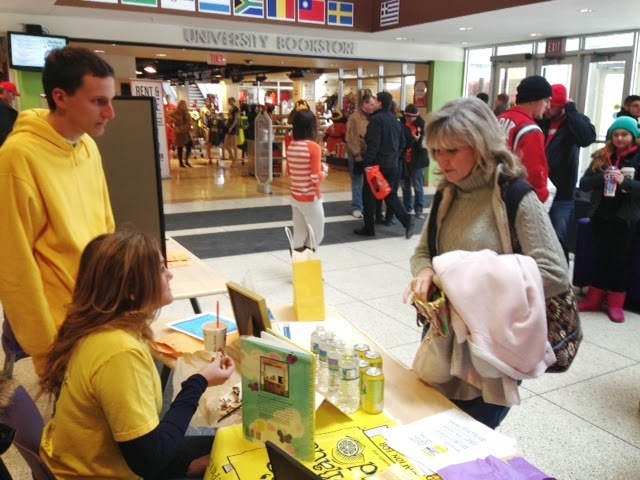 Perspective Student Day at BGSU also makes for an optimal lemonade stand day! Our stand was in the heart of the Union fed by the perspective student traffic and hungry BG college students. 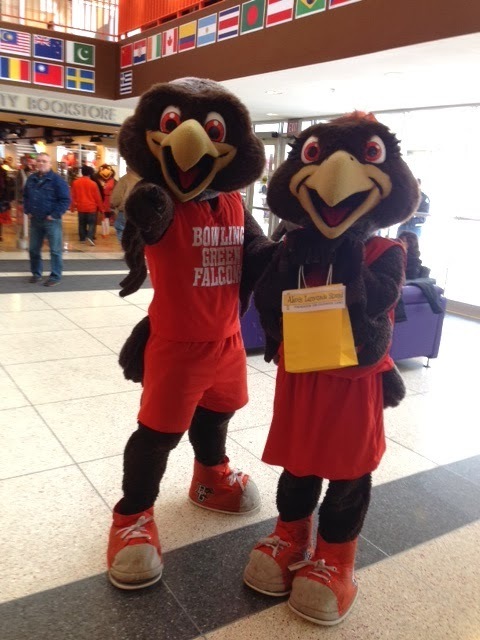 This year our donations were upped by some celebrity endorsements: Frieda and Freddie Falcon, BGSU's beloved mascots! Thank you to CMLA for partnering with me again this year! I'm happy we raised over $200.00! Of course I thought she'd ask me great questions about potential majors and other academic items on our way home from campus, but no she said, "I think I'd like to be Frieda! What are tryouts like?" Oh, my! NOT what I was hoping for! What a hoot! But seriously, I think she could do it: She's outgoing, bubbly, loves people and has TONS of energy! Every day world-wide, 720 kids are diagnosed with cancer. 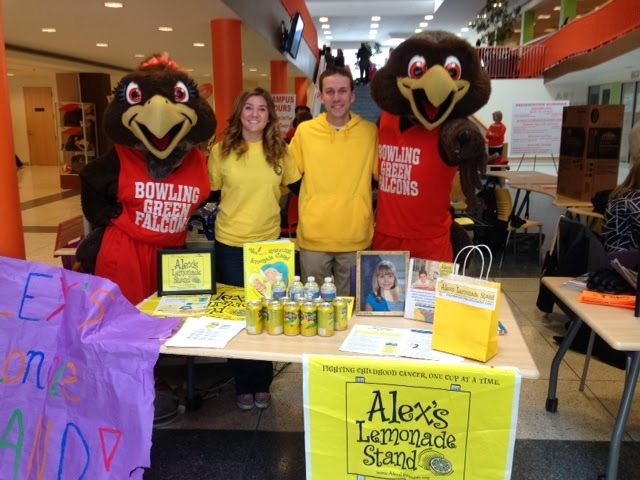 Last year I worked with BGSU's CMLA to raise over $500 for Alex's Lemonade Stand, an organization devoted to funding a cure for childhood cancers. 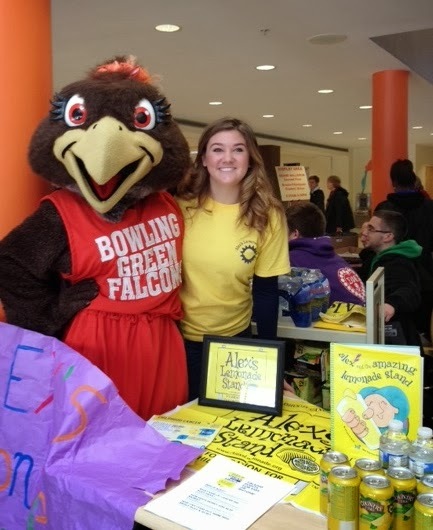 On Monday, Feb. 17th (President's Day) CMLA members and I will be in the BGSU union from 10am-1pm distributing cans of "Country Time" lemonade in exchange for a donation to Alex's Lemonade Stand. If you're around BGSU, please stop by. I'd love to talk to you! Checks should be made payable to Alex's Lemonade Stand Foundation. If you'd like to text in a $10.00 donation text: lemonade E1112898 to 85944. It will show up on your carrier. Shayla says: As you probably already know, instead of having a birthday party or receiving gifts for my birthday this year, I've asked my parents to secure a space and to hire a DJ for a "Lemon Ball" - a fundraiser for Alex's Lemonade Stand where my friends will wear their "old" homecoming dresses and come to a dance party! No gifts will be accepted, unless it's a donation to ALSF! Well, most all of the invitations have been distributed and my fundraising goal set! It's almost time for the Lemon Ball! If you're interested in helping me achieve my goal of raising $1,500 for Alex's Lemonade Stand at this event, please click here. It will take you to my "Lemon Ball" fundraising page where you can easily donate to this deserving cause. I'm most appreciative of those who have already donated and of those who are considering. Thank you for allowing researchers to find the cure that's needed for children and their families everywhere! 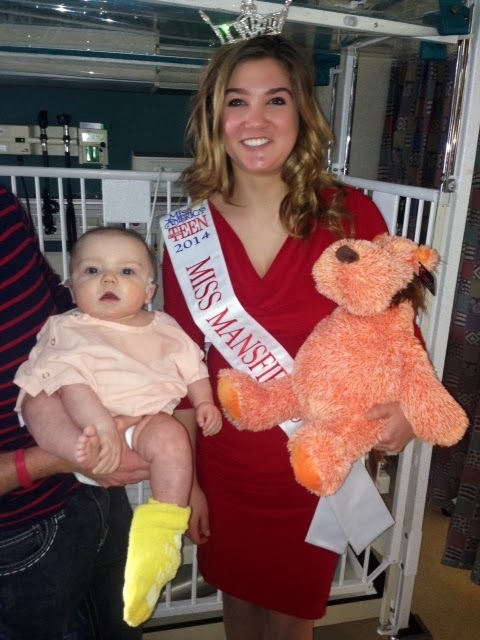 Shayla's heading back to Mansfield - as Miss Mansfield's Teen! 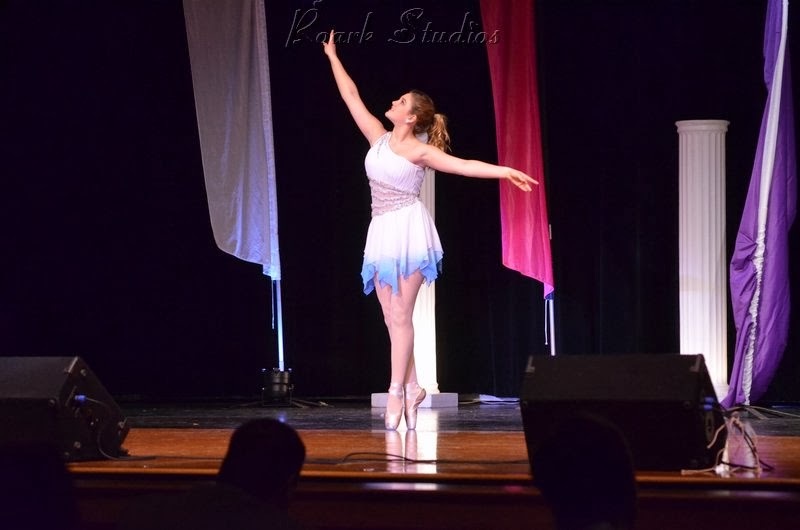 Much to my surprise and delight, Shayla won her local pageant and therefore earned the right to compete for the state title again this summer! 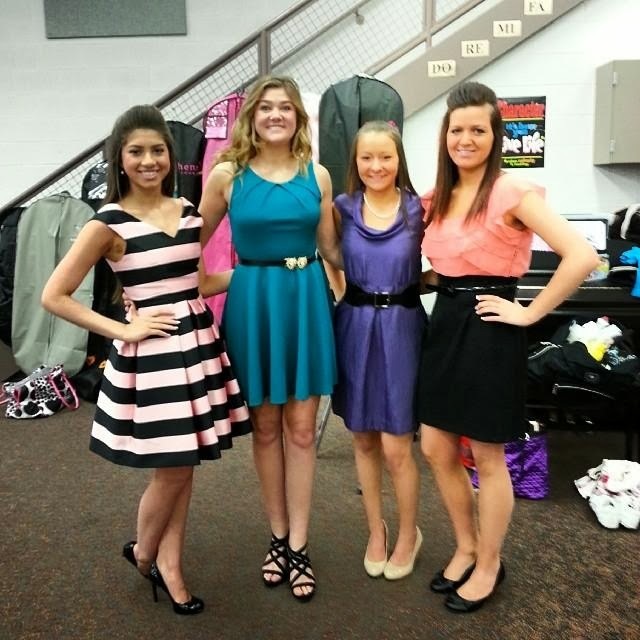 Shayla with Miss Ohio's Outstanding Teen 2013. The teen program of Miss America is now in its ten year! Miss America is the world's largest provider of scholarships to woman. (That's how 100% of my Master's degree was funded!) Shayla won a small scholarship and other prizes, but she's really pleased about just winning this local - the one many believe to be the most coveted because the state pageant is held in Mansfield and you're really treated like the "hometown girl" as the citizens of Mansfield roll out the red carpet for you during Miss Ohio week. In her press conference, the morning following the pageant, Shayla said many things including: I'm grateful for this opportunity and look forward to serving the Mansfield community during my year as their teen titleholder. 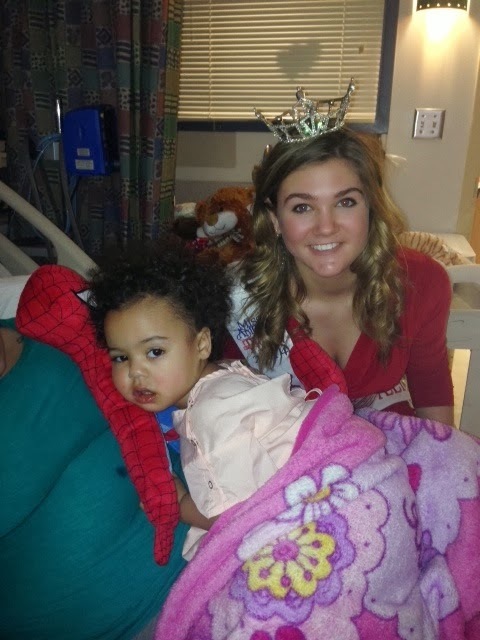 The main reason I enjoy being a titleholder is because it offers me the opportunity to serve even more in communities with my platform of pediatric cancer awareness and research. 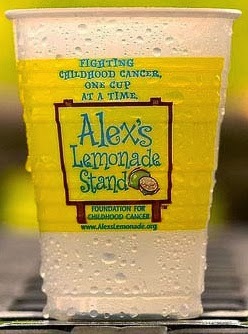 I will soon be 15 and during this year I want to raise an additional $5,000 for Alex's Lemonade Stand. Our thanks to the Mansfield News Journal for putting in the front page news article. 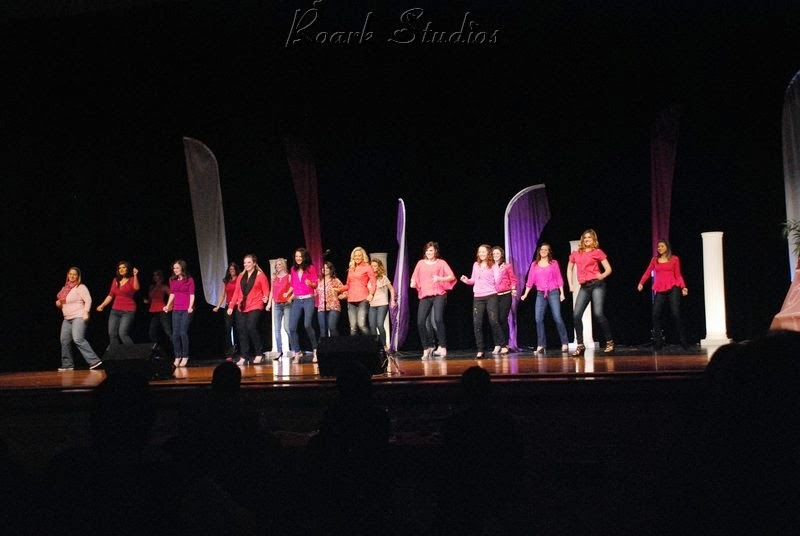 As Shayla recently wrote: This local is truly amazing; it's often referred to as a "little" Miss Ohio because of its excellence in production, competition, and assemblance to the state pageant. The other teens were all wonderful and very sweet! I enjoyed getting to know them. 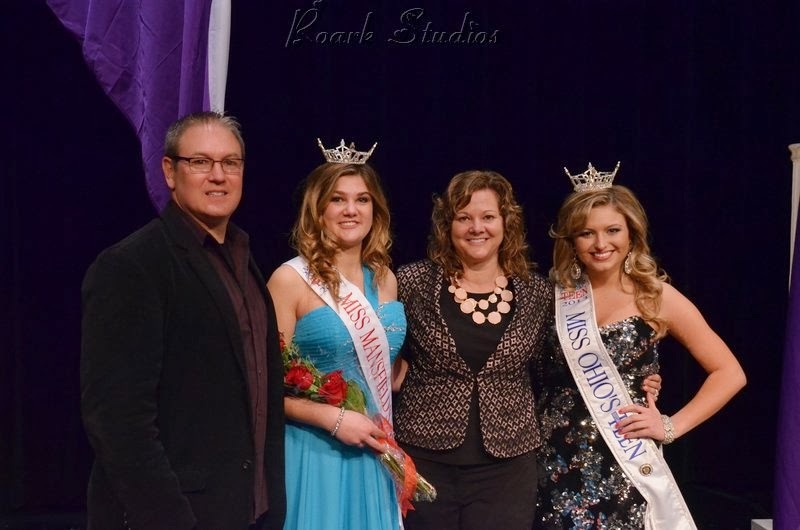 The titleholders from this local are fortunate to have many speaking opportunities and involvement in the community, which is my favorite part of being a title holder. My thanks to the director and all of the wonderful volunteers who make it all happen! 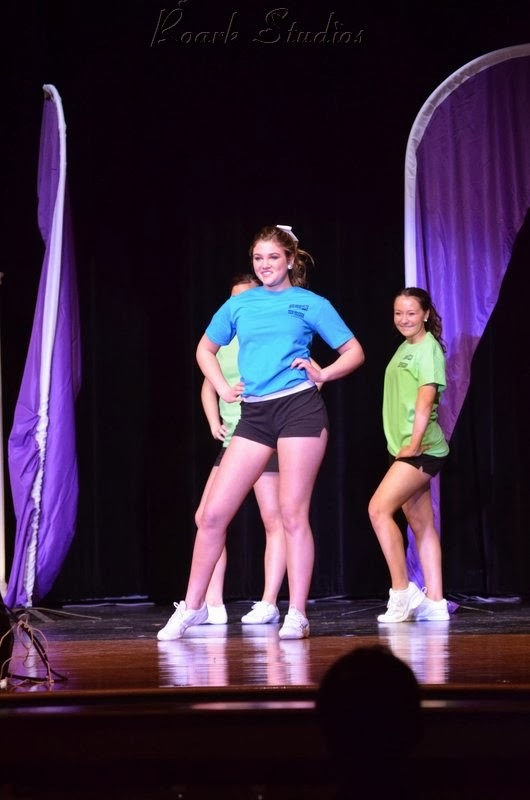 Opening Number Dance Routine! (Shayla loved this! Shayne and I thought we saw too much hip shaking! Evening gown and onstage question about platform (Pediatric Cancer Research) 20% of the competition. 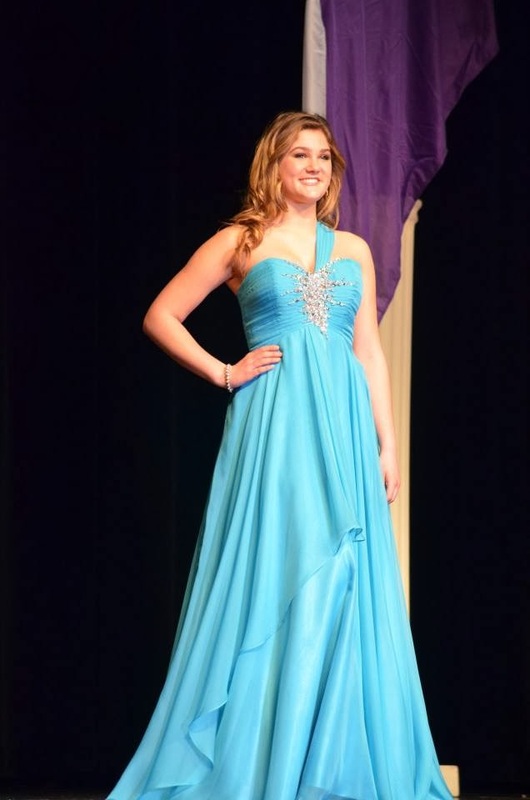 Asking the questions is Hannah, Miss Mansfield's Teen, 2013. *Here is Shayla smiling after doing the routine with kicks, push-ups, runs and dancing in it. Waiting with some of the other teens before private interviews with the panel of judges. 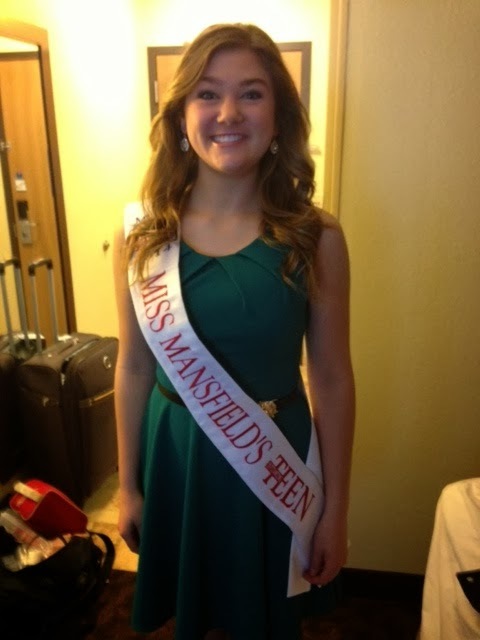 Ready to leave the hotel room for her first press conference as Miss Mansfield's Teen! We packed our ski clothes and planned to overnight in Mansfield so we could downhill ski there in the morning at "Snow Trails". Little did we know she'd win and she'd have a press conference instead! What a tremendous surprise!